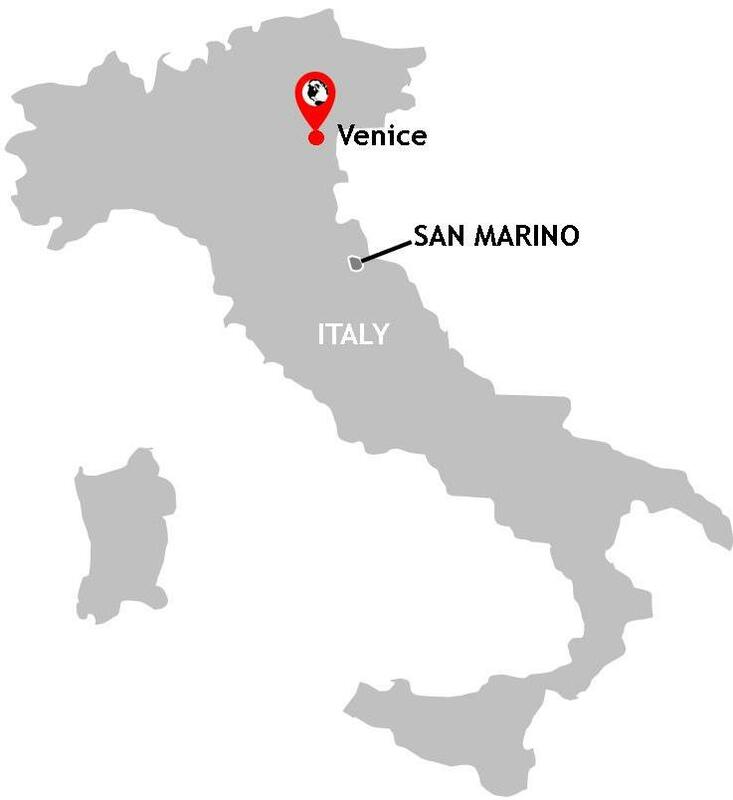 Where: Venice, Lido, Murano , Burano & San Marino City. Italy & San Marino. What: The Grand Canal, St Mark’s Square and Bell Tower, San Marco Basilica, Gondola Ride, Basilica di Santa Maria, The famous Rialto Bridge, Marino Glass Arts,The First, Second and Third Tower Fortresses, Mount Titano, Public Palace, Piazza della Liberta, Basilica di San Marino, Gun shops. How: Vaporetto, Monorail, Trains, Coach, Airplane, Walking, Taxi. Illnesses or mishaps: Developing a heat rash on my face; Injuring my finger which required antibiotics and a visit to a local clinic; Damaging my gums on a very hard travel toothbrush resulting in tooth ache; Forgetting all of my travel documents, and passport, on my journey to San Marino. I am not averse to visiting the lesser-known and lesser-visited places out there. Flying to Venice, Italy's iconic city of water, opened up the possibility of experiencing one of the world's most petite of countries - and one still on my 'to do' list: San Marino. Sampling San Marino has brought me tantalisingly close to achieving the feat of having visited every country on the continent (with only Belarus and Monaco now remaining). With my impending return 'home' to Australia my quest to conquer every country in Europe has to go on a little break of its own. That's Europe on hold. For now anyway. My trip through Italy to San Marino was a not-too-dissimilar reprise of other journeys designed to tease out some of Europe's more diminutive and harder-to-get-to countries. These are countries which coyly ensconce themselves away in the mountains, keep sheepishly low profiles and, more often than not, teasingly lack simple, direct transport links. It is only the traveller, not the tourist, who has the tenacity and will to experience these often overlooked microplaces. Such journeys have included my using of Barcelona in Spain to get to Andorra nestled in the Pyrenees; travelling to Basel in north west Switzerland to experience the Lilliputian Liechtenstein tucked away in the Alps; bussing it from Brussels in Belgium to sample the little-sized Luxembourg. Experiencing these places has taught me something important about travel: sometimes the most beautiful of places come wrapped in the smallest of packages. And sometimes the harder you have to work at getting somewhere the greater your sense of fulfilment. You have to give it to Europe - it's a continent which does micro countries brilliantly. Venice is a tourist trap of the first order. Unfortunately our visit coincided with a visit by, seemingly, half of humanity. July is arguably the worst time to visit this enigmatic city on water - not only is this peak season but Venice also reaches its peak temperatures, too. Your experience of Venice, undoubtedly one of the most beguiling places on the continent is, therefore, punctuated (or is that punctured?) by tourist swarms holding aloft a sea of selfie sticks which hover into every photograph you attempt to take like a new species of annoying, tenacious insect. Of course, I have been to many a tourist honey trap in my time - it's a necessary evil of travel. It's on this kind of tourist trail where travellers practise in a relatively safe environment and cut their travel teeth for more daring escapades. But rarely is a place so deserving of the numbers it attracts as Venice: it's all of the clichés you've seen and heard. Gondoliers navigate their iconic craft through surprisingly serene waterways; centuries old buildings rise out of the turquoisey waters in a state of fairy-tale decay; beautifully ugly gargoyles peer down at you sympathetically from their advantageous vantage points above doorways and bridges; and dainty, Lilliputian stone bridges make silent, dignified efforts to withstand the immense weight of human bodies above. It is a tribute to the stonemasons of this great city that, somehow, these bridges do so. As you traverse Venice's labyrinthine passageways you may also notice strange, and rather new, metal installations around the bottoms of doorways - a reminder, if any were needed, that the ground you are currently standing on was once, albeit temporarily, claimed by the Lagoon's deep green waters. Indeed, several towers in the city appear to tilt at dizzying angles (giving the famed leaning tower at Pisa a run for its money), adding to the sense that Venice is very vulnerable and that you are, guiltily, hastening its demise by just being there. Never before have I seen a place whose success and whose fragility are so inextricably, and perhaps so fatally, intertwined. References here to the Lost City of Atlantis or Pompeii may be trite but not entirely inappropriate. Venice is precious, beautiful, temporary. Gondola rides, the Piazza San Marco and the Grand Canal colour many people's perceptions of what Venice is. However, many miss the islands around it - each with its own personality and each offering their very own unique form of sanctuary from the epicentre of tourism. Venice's water taxi network offers easy and cheap access to these often overlooked places. Two particularly worthy of your attention are in the Northern Islands - the similarly sounding, but contrasting, Murano and Burano. Murano is internationally renowned for its creative glass-making - everything from chandeliers and ashtrays, to clocks and jewellery. It's an island where Venice's artisan industry continues to hold steady against the sweeping tide of cheap imports. A further half an hour north-westwards on the vaporetto from Murano brought us to the wonderful technicolour island of Burano. Modest buildings of every colour line the island's narrow canalways interrupted by the dinkiest of bridges. 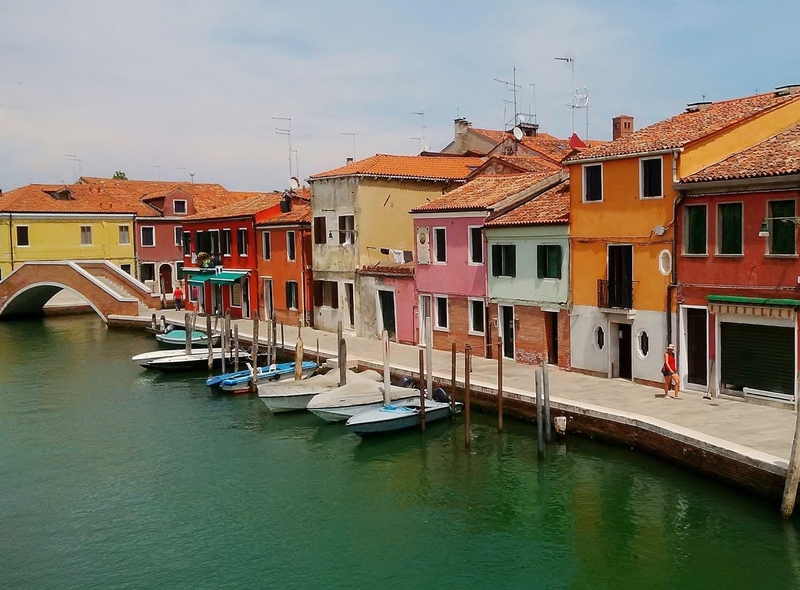 Burano appears not dissimilar to a pack of Opal Fruits (or Starburst if you must) which have forfeited their plastic jackets and been lined up military-wise along the canal banks - a rainbow assortment of lemon sherbets, mints, strawberries and peaches. Indeed, striped fabrics flapping in their buildings' apertures add to the sensation that everything on this little wonder of an island is candy-like and edible. I was peckish but resisted the temptation. We opted to rent an apartment from a local couple on another of Venice's islands. Lido is a sliver of land at the eastern edge of the Lagoon and once the preserve of Europe's artists and glitterati. It is now mainstream and, thankfully, with a short trip from San Marco on the vaporetto, offered us respite from the waspish hordes of tourists who are dumped en-masse into the city by gigantic white cruise ships. Renting an apartment from a local bypasses the corporate hotel chains and puts money directly into the hands of ordinary people. Gianni and Barbara's home was as Italian as you could hope for: gaudy colour-changing light fittings, a Gaggia espresso machine, a shower with more buttons and flashing lights than a spacecraft, a bidet and a computer mouse covered in faux snake skin. Renting from a local home owner is more of an authentic experience versus a generic hotel where the foibles and idiosyncrasies which differentiate one culture from another have been removed. These islands offer escapism, a cheaper place to spend the night and the chance to feel more traveller than tourist. My advice is to grab the chance to rent from a local with both of your sweaty, sunburned, selfie stick wielding hands. Everyone should go to Venice once in their life - but this was my twice owing to a family commitment. I therefore contented myself with the challenge of improving on my photography from first time around when I was both a novice traveller and novice photographer. It wouldn't be that difficult, I assured myself. Back then it was all about zapping a few obvious sights, now it was about capturing Venice's soul with a more sophisticated attention to detail - the results of which you see below. I hope you feel I succeeded. The Basilica di Santa Maria della Salute. Watery dwellings along the Grand Canal. 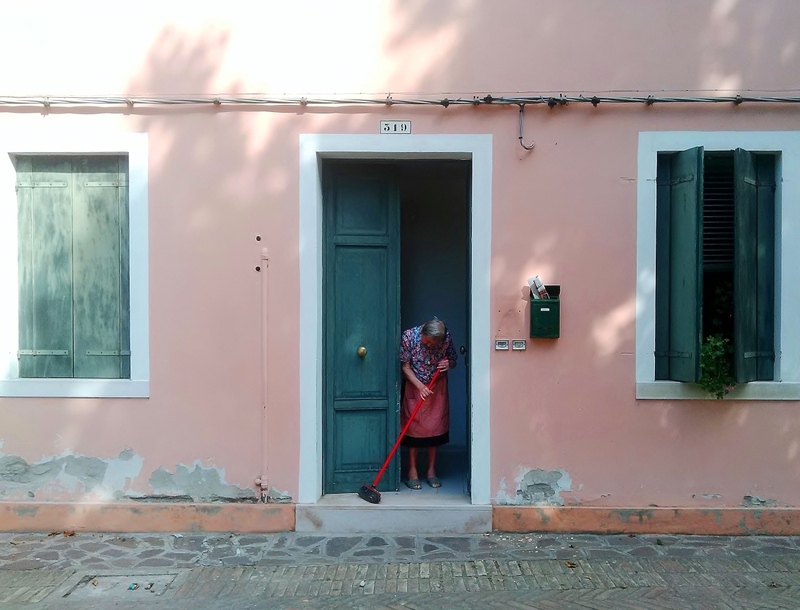 An elderly woman sweeps her doorstep on the Northern Island of Burano. 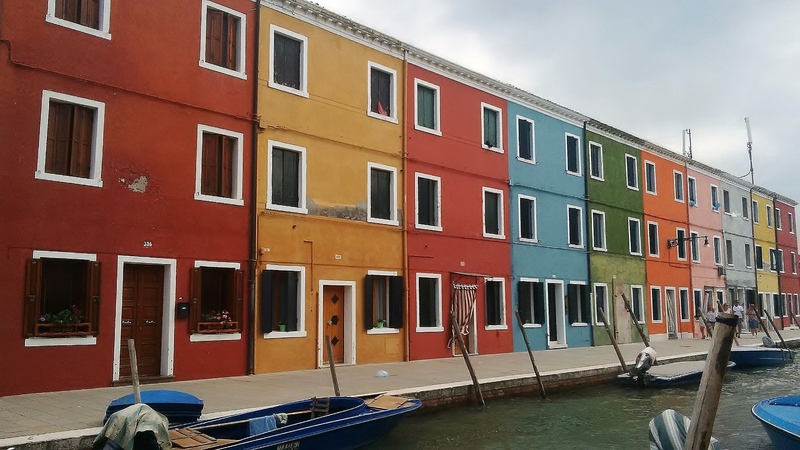 The wonderfully colourful Murano - part of Venice's Northern Islands. Burano - a rainbow assortment of lemon sherbets, mints, strawberries and peaches. Indeed, striped fabrics flapping in their buildings' apertures add to the a child-like sense that everything on this little wonder of an island is candy-like and edible. San Marino is a coy and reticent little thing, ensconced, as she is, high up in the Apennine mountains. She is not easy to get to if you happen to be based anywhere other than her immediate environs. She has no railway station nor airport. My journey from Venice Lido to San Marino City went thus: bus to water taxi dock at Lido SME (5mins), a vaporetto to Piazza Roma in central Venice (40mins), the People Mover monorail on to Tronchetto (10mins), a FlixBus coach down to Rimini (4hrs 20mins) and a taxi up to San Marino City (35mins). As you have probably noticed I relented and jumped in an expensive taxi to complete the journey. I wimped out as there was no guarantee I would get a seat on the much cheaper, but much busier, shuttle bus and I couldn't face queueing in the heat for a seat which may but may not be mine. My journey back would skip the coach and instead involve a direct train from Rimini to Venice's Saint Lucia Ferovia station on TrenItalia which made the return leg a bit easier. Despite the annoyingly indirect route needed, I was determined to tick off this micronation - said to be the oldest sovereign state in the world and the country with the oldest legislature still in force today. It is an enclave surrounded by Italy - and a nation which guards its sovereignty and independence fiercely. Don't commit the faux-pas of referring to people here as Italian or San Marino as being part of Italy. You'll be met with a swift and justified rebuttal. San Marino may sound like a beach resort but it is a country with its own flag, postal service, legislature and government. What San Marino lacks in size it makes up for in passion - and as the old adage goes, size isn't everything. To put it in context, San Marino is a country the size of the city of Leicester in England's midlands. I based myself in San Marino's historic centre. With its battlements, large stone walls, archways and dancing flags the place hovers somewhere between a toy town folly and Gothic masterpiece. The city is overlooked by three towers crowning Mount Titano - imaginatively named the First, Second and Third Tower. Two and Three are nothing to write home about but the first is truly deserving of its prime location along the numerical scale. Perched defiantly on a giant twisted rock - a geographical feature designed with imposing castle in mind - is the most impressive castle I have ever seen. Just this one sight on its own is enough to make up for the hassle and expense of getting to San Marino. Rocketing into the sky on a single shard of granite, this castle is straight out of central casting for a fantasy adventure film with the most expensive budget and with the most ambitious of directors. The gentle undulations of the landscape surrounding this edifice serve to make this twelfth century spectacle all the more awesome. San Marino City is a strange, contradictory concoction of ingredients. There is the element of medieval fantasy, of course, but it is unfortunately accompanied by a glut of tourist-geared shops selling everything from fridge magnets to slush puppies - to the exclusion of any other type of shop. It all feels a little Alton Towers. Then there is the inexplicable and disproportionate amount of Russian tourists - so much so that menus and guides are written using the Cyrillic alphabet. It is very much "nyet" here, not "no" or "non". Perhaps most incongruous and surprising of all are the gun shops selling everything from kalashnikovs to balaclavas, military daggers to swords. San Marino must be one of the few places in Europe where you can buy a fridge magnet or souvenir teddy - and pop next door for an assault rifle. Who is buying this stuff? And more worryingly, what the hell are they doing with it?! Bizarre. This romantic medieval idyll hidden in the mountains suddenly felt a little more unsettling. San Marino is a city stuffed full of day-trippers who descend and vanish just as quickly. Congested streets and annoying families depart by mid evening leaving those few who've chosen to spend the night, me included, with a bit of respite and a chance to saunter the cobbles relatively free of annoyance. Food and accommodation in the city are unlikely to win any international awards but are refreshingly cheap. Good job as most of my money went on getting there in the first place! Welcome to San Marino - my 72nd country. The long, frustrating road from Venice Lido to San Marino: bus, vaporetto, people mover monorail, coach and finally taxi. I was determined to get there! The stunning First Tower Fortress perched high up on a peak of Mount Titano. 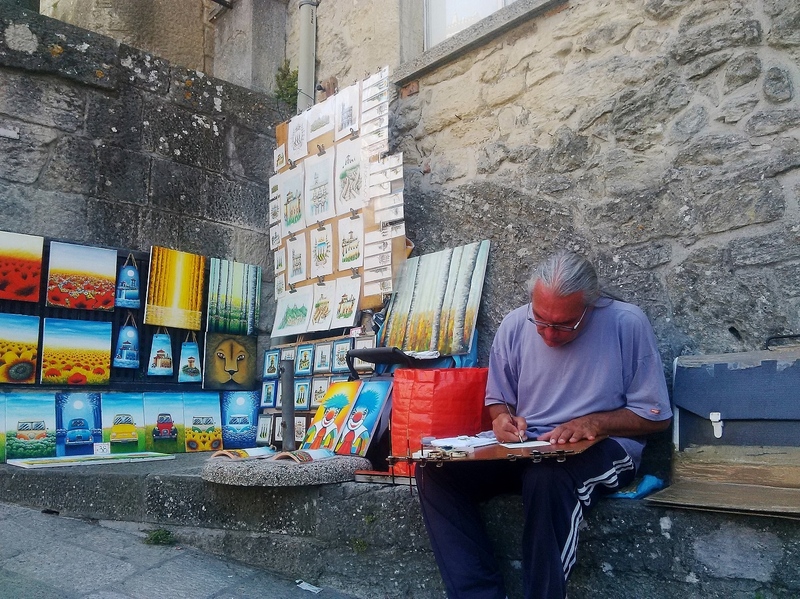 A talented, and very friendly, artist gets painting in San Marino City. He helped me find my way back to my hotel (I even managed to get lost in a city as small as this). In Venice it pays to think carefully about which area you stay in. 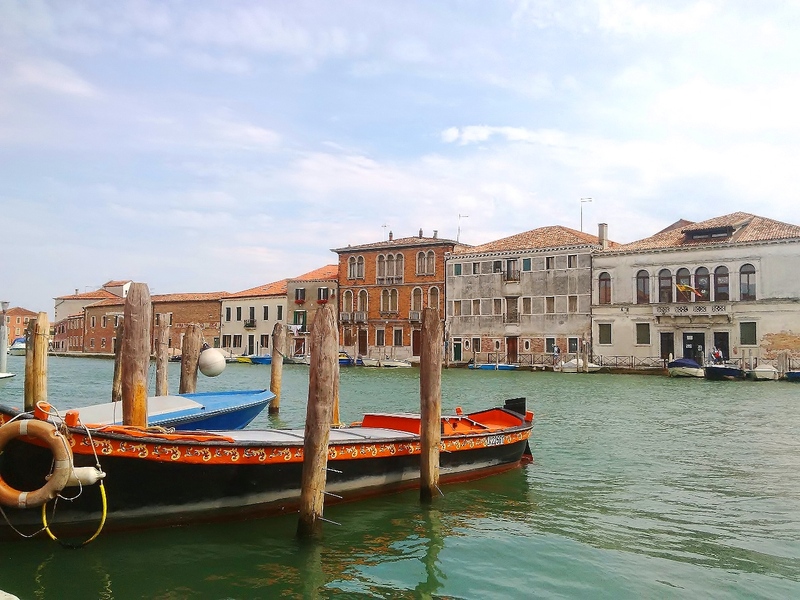 Avoid booking a hotel based on price or availability - this could be a costly mistake as travel around Venice and its islands is a bit of a hassle and a bit expensive, too. Book a hotel in an area with the things you want to see. Whilst taking vaporettos is a novelty, after a few days it does become tiresome. Also consider how you will be arriving and when as this can have an impact on where you book your bed. Venice is a city of water - very wobbly water, too, thanks to the speed boats churning the waters up into choppy-like rapids. If you don't travel well on boats you may want to adjust your itinerary accordingly to lessen the number of trips you make in any one day - especially if you have chosen to stay on Lido or Murano. The vaporettos made me feel ill on several occasions. Get the 'Venezia Card' - a great way of taking out the hassle of queuing to buy tickets for public water transport and buses. It's expensive (60€ for 7 days) but makes life easy. It is no surprise that I advise against travel to Venice in peak season. If you are lucky enough to choose when you travel, opt for off season. When in Venice make sure you go island hopping and, if you have bought a Venice card, doing so will not cost you a Cent extra in travel. It's not big, of course, but if travelling to San Marino be sure to print off a map of its capital before you go. A quick internet search yields several useful versions to help you navigate the city quickly - especially useful if this is, like so many are, a flying visit. San Marino can be reached from Rimini and a shuttlebus takes about an hour from there. There is no way of booking tickets in advance to secure a seat - it's first come first served. If your time in San Marino is already short, get a taxi. You may read online that you will not need your passport to go to San Marino. This is correct in that there are no border checks. However, if you are staying the night hotels in San Marino do insist on seeing your passport. Luckily I was able to download a copy of mine from OneDrive and this placated the officious receptionist at my hotel. If you're staying the night - take it.